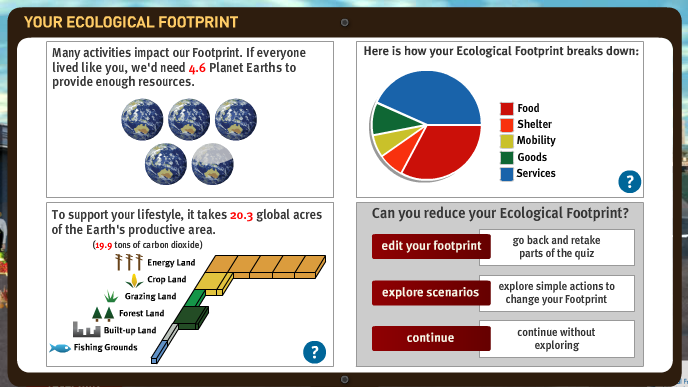 Earth Day Network Footprint Calculator! - AP Environmental Science! 1. How often do you eat animal based products? Why do you think this affects your footprint? I think it will affect a lot because if I eat meat very often it means I kill animals everyday. 2.How much of your food is processed, packaged and not locally grown? Why do you think this affect your footprint? I think it wouldn't affect my footprint because I don't really eat packaged daily and processed daily. 3.How much trash do you generate? 60% since I have a small family. What affects does this have on your footprint?Why? 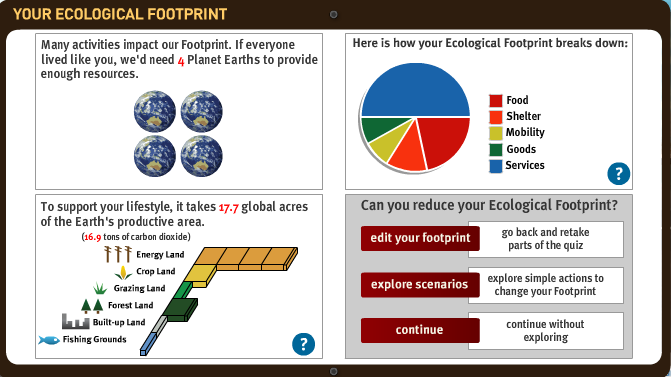 It wouldn't affect my footprint because 60 percent is not a lot and I think it actually make impacts. 4.Which housing type best describes your home? A lot of tree's and grasses. Why would this make a difference in your impact? It would make an impact because I actually have natural resources such as trees around my house and it would show that I'am saving the earth instead of the opposite. 5.Do you have electricity in your home? What are the environmental impacts of electricity? We all know that electricity is daily use and people need electricity to live in this world but it will impact a lot. 6.How many people are in your home? 7.What is your house made off? Which building material is the most energy efficient? I think wood because it interact with the energy faster and that's what mostly houses made out off. 8.Does anyone of your home's electricity come from renewable sources? 9.How far do you travel by car each week? Do you carpool or do anything to reduce your impact? 10. Do you ride a motorcycle? 11.What is the gas mileage in your car/motorbike? 12.How often do you drive with someone else? 13.How far do you travel by bus/train each week? 14.How many hours do you fly each year? I learned through this activity is that by changing the electricity amount use daily and since wood is the most material building that most energy efficient I save so much energy use around the house. Also, by eating a lot of natural process food and fruits the amount of earth to be use decrease down which is good because I don't need a huge amount of earth to support me. Not only that when I change the size of my house I actually have spaces for gardening to also save my money from buying food. These type of changes made a huge impact from my first foot print I know it's hard to be vegetarian but it can save your life.